To Cite: Saleh P, Zarrintan A, Zeinal Zade A H, Piri R, Mohammadi S, et al. Efficiency of Helicobacter pylori Infection Treatment Protocol: Clarithromycin, Amoxicillin and Omeprazole, Arch Clin Infect Dis. 2012 ; 8(1):14-7. doi: 10.5812/archcid.14408. Background: Helicobacter pylori (H. pylori) is one of the most common pathogen affecting humans, which is approximately infecting 50% of the world population and remains as a significant cause of morbidity and mortality. Since the discovery of Helicobacter pylori in early 1980, many treatment regimens have been developed to effectively treat this infection. Despite the extensive research over the last 25 years the treatment of Helicobacter pylori remains a challenging clinical problem due to its antimicrobial resistance. Objectives: This study aimed to evaluate Clarithromycin, Amoxicillin and Omeprazole efficiency as a treatment for H. pylori. Patients and Methods: The patients with clinical features of H. pylori infection and positive serological and clinical test results were entered to the study. Whole of the patients enrolled in the study were given a full two weeks of effective treatment protocol of H. pylori consisted of Clarithromycin (20 mg PO bid), Amoxicillin (1 g PO bid) and Omeprazole (20 mg PO bid) together. Our variables in this study were blood IgG and CagA factor levels, which were collected using serological tests and the H. pylori stool antigen was another variable in the study which was taken from stool tests. Results: Results showed that the mean level of IgG and CagA of blood samples was lower in the study group than the control one. Moreover, the average level of H. pylori antigen in stool was lower after the treatment. Conclusions: The result of our study showed that using Clarithromycin, Amoxicillin and Omeprazole for treatment of H. pylori infection can be useful. It is concluded from lower levels of IgG and CagA in blood and H. pylori antigen in stool after treatment compared to the amount of these factors before therapy. Considering all these data, it is obvious that there is an urgent need to found a better therapy and treatment for H. pylori infections in which it cause low bacterial resistance. Helicobacter pylori (H. pylori) is a gram negative, spiral and flagella bacteria, colonized in the mucosa of stomach which has an important etiologic role in gastric diseases especially gastric ulcers (1). H. pylori is one of the most common pathogens affecting humans, which approximately infects 50% of the world population that remains as a significant cause of morbidity and mortality (2). Several studies have shown the relationship among this organism and some other gastric diseases such as ischemic heart disease, idiopathic thrombocytopenic purpura, and iron deficiency anemia, etc. (3). Recent evidences demonstrate that H. pylori has an important role in some of the skin diseases progression, e.g. Reynaud’s disease, Rosacea, prurigo nodular is atopic dermatitis and chronic urticaria (4, 5). H. pylori is a very common infection which occurs at young ages in developing countries. One of the significantly independent risk factors for infection is low socioeconomic status (6). Many epiddemiologic studies of H. pylori have confirmed that the infection to this bacterium is observed among children in developing countries, which may be due to bad household hygiene and sanitation (7-9). Furthermore, these studies about H. pylori transmission showed that the majority of infections tend to occur within families through close person-to-person contact (10). H. pylori infection seems to be transmitted most readily among siblings who are in same age and mostly from older siblings to younger ones (11). Since the discovery of Helicobacter pylori in the early 1980 many treatment regimens have been developed to effectively treat this infection. Despite extensive research over the last 25 years, the treatment of Helicobacter pylori remains a challenging clinical problem due to antimicrobial resistance of bacterium. The third Maastricht consensus report agreed that effective treatment of H. pylori should achieve an intention-to-treat (ITT) eradication rate of over 80% (12). According to the Maastricht consensus conference and the American College of Gastroenterology, recent guideline for first-line treatment of H. pylori infections is the combination of a proton pump inhibitor (PPI), bismuth, metronidazole, and tetracycline (bismuth quadruple therapy) for 10 - 14 days with a PPI, clarithromycin, and amoxicillin (clarithromycin triple therapy) for 7 - 14 days (13, 14). Despite these recommendations, there are growing concerns about the efficacy of these regimens because of possible increases of clarithromycin and metronidazole-resistant strains of H. pylori (2). Since there is no certain and reliable treatment for H. pylori infections and development of new resistant bacteria to specific antibiotics, in this study we are aimed to evaluate Clarithromycin, Amoxicillin and Omeprazole efficiency as a treatment for H. pylori. The study hospital (Sina and Imam Reza hospital, Tabriz, Iran) is a five hundred-bed, tertiary care, teaching hospital with approximately 50000 admissions per year which serves about one fourth of Iranian population. This clinical randomized study was carried out from July 2010 to October 2011. During the study period, all the suspicious patients who had referred to these medical centers were investigated in regard to H. pylori infection. Eighty patients with clinical features of H. pylori infection with positive serological and clinical tests results entered to our study. After checking all the selected patients in regard to clinical and laboratory aspects and considering our study limitations, eighty patients with exact clinical and serological evidences of H. pylori infection compromised our study population. All participants have signed a written consent, and the study protocol was approved by the ethics committee of Tabriz University of Medical Sciences (TUMS), which was in compliance with Helsinki Declaration. All the patients whom entered to the study were young and middle age patients without any endoscopy or other operation and sever infection history. Demographic information, age and gender, were also collected. All the patients enrolled in the study were given a full two weeks of effective treatment protocol of H. pylori which is consisted of Clarithromycin (20 mg PO bid), Amoxicillin (1 g PO bid) and Omeprazole (20 mg PO bid) together. Then patients were being followed for 2 weeks in order to make sure that there is not any possible side effect of this treatment course. Our variables in this study were blood IgG and CagA levels by using serological tests the H. pylori stool antigen was another variable in the study which was obtained from stool tests. All variables were measured twice, before and after the period of therapy, for each patient. Statistical analysis was performed by SPSS software package version 16.0 for windows (SPSS Inc., Chicago, USA). Quantitative data were presented as mean ± standard deviation (SD); moreover, in regard to statistical analysis of data, collected data were studied using paired T-test. P value less than 0.05 was considered statistically significant in all the steps. Eighty patients whom were entered to the study were 51 (63.8%) men and 29 (36.3%) women, which showed no significant differences. The mean age ± SD of patients were 29.5 ± 5.5 with maximum age of 40 years and minimum of 17 years. The mean concentration of blood IgG level was 72.45 ± 94.7 before and 49.41 ± 43.36 after the treatment, with a statistically significant difference (P = 0.014, t = 2.5), which demonstrating lower blood IgG level in treated patients. Also the mean concentration of CagA in blood samples was lower in study group, it was 43.58 ± 34.65 before and 28.04 ± 24.49 after the treatment which was again showing a statistically significant difference (P < 0.001, t = 5.6). The average amount of H. pylori antigen in stool before and after the period of study was 63.41 ± 40.79 and 12.93 ± 12.75, respectively with the mean difference of 50.49. Statistical analysis were totally determined the meaningfulness of this difference (P < 0.001, t = 10.79). 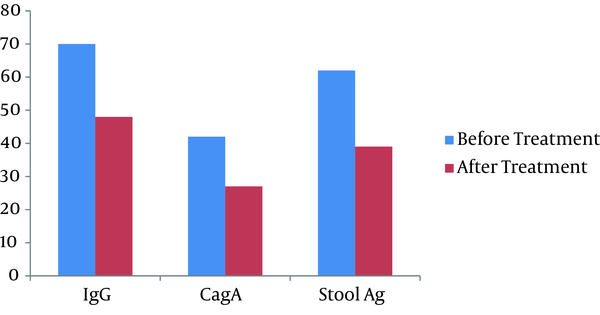 Table 1 and Figure 1 show the blood IgG and CagA level of the patients and also show the amount of stool antigen before and after treatment in patients. Helicobacter pylori (H. pylori) is a gram negative, spiral and flagella bacteria, which colonizes in the mucosa of stomach and has an important etiologic role in gastric diseases especially gastric ulcers (1). Helicobacter pylori is one of the major causative agents of gastrointestinal infections in adults and children worldwide, and has been implicated in the pathogenesis of active and chronic gastritis, peptic ulcer and gastric carcinoma. These bacteria attracts to the gastric epithelium through direct toxicity and indirect inflammation-mediated damage (15). One of the major problems in the medicine is infection caused by H. pylori. These infections can result in several sever gastric and even skin diseases (4). To find a reliable treatment in order to eradicate H. pylori is excessively necessary. Unfortunately over the last decade, it has been widely reported that the success rate of Helicobacter pylori eradication treatment is falling, which is due to resistance to antibiotic therapies (12, 16). The result of our study showed that using Clarithromycin, Amoxicillin and Omeprazole in H. pylori infections can be useful. The blood IgG and CagA levels and the amount of H. pylori antigen in stool has been lowered after the treatment compared to before therapy. The study of Aminian et al. in Tehran Medical University (Tehran, Iran) also supported the results of our study, which has showed standard 10 days therapy with Omeprazole, Amoxicillin and Clarithromycin had the highest efficacy (90.7%) (17). Other studies in this regard also have shown similar results; The study of Odaka et al. showed that eradication of H. pylori was seen in 155 cases out of 163 (92%, CI 95%: 88% - 96%) using Amoxicillin, Metronidazole and Roxithromycine (18). In another study by A. Zullo et al. a new approach in H. pylori-infected patients, receiving 10 days sequential therapy [Rabeprazole (40 mg daily) plus Amoxicillin (1 g twice a day) for the first 5 days, followed by Rabeprazole (20 mg), Clarithromycin (500 mg) and Tinidazole (500 mg) twice-daily for the remaining 5 days] eradication of H. pylori was higher than the control group (19). Ivan F. N. Hung et al. in a study found that the standard seven-day clarithromycin containing triple therapy is still valid as the most effective empirical first-line eradication therapy for H. pylori infections in Hong Kong, as the prevalence of primary resistant H. pylori to Amoxycillin and Clarithromycin remains low (20). Bruno Sanches et al. in their study reached to the conclusion that both once-daily triple (Rabeprazole, Levofloxacin and Furazolidone) and twice-daily quadruple therapy (Rabeprazole, Bismuth Subcitrate, Doxycycline and Furazolidone) for 10 days achieved encouraging results (21). Ghadir et al. reported that the treatment of Helicobacter pylori infections by using triple therapy based on Furazolidone (Furazolidone, Amoxicilin, Omeprazolee and Bismuth) was not effective (22). Other studies have revealed that the prevalence of H. pylori infection in developing countries is higher in young age patients. Our study also demonstrated that there are no significant differences between males and females with H. pylori infections (8). On the other hand, a meta-analysis by Fischbach et al. demonstrated that treatments which are very effective for patients with H. pylori infections in developing countries cannot be presumed to be effective in patients from other countries. This study also criticize the treatment recommendation of consensus meeting, neither it is more successful in targeted areas nor it has considered other geographical regions where infection of H. pylori is high and where child infection and metronidazole resistance are common (23). Hence, it is strongly required that recommendations for treatment of H. pylori infection should be evaluated in geographical areas due to resistance to specific antibiotics in specific areas. Considering all these data, it is obvious that there is an urgent need to found a better therapy and treatment for H. pylori infections in which inducing lower bacterial resistance. This research was supported by a grant from Infectious and Tropical Disease Research Center of Tabriz University of Medical Sciences. Implication for health policy/practice/research/medical education: Clarithromycin, Amoxicillin and Omeprazole for treatment of H. pylori infection can be useful which is concluded from lower levels of IgG and CagA in blood and H. pylori antigen in stool after treatment compared to the amount of these factors before therapy. Authors’ Contribution: Parviz Saleh: a, b, d, f, j, l; Armin Zarrintan : c, d, e, f, j; Ali Hossein Zeinal Zade: b, d, g, h, j, k, l; Reza Piri : c, h, i, k; Mohammad Naghavi-Behzad: a, b, d, g, h, j, k, l. Concepts(a), design (b), definition of intellectual content (c), literature search (d), clinical studies, experimental studies (f), data acquisition (g), data analysis (h), statistical analysis (i), manuscript preparation (j), manuscript edition (k) and manuscript review (l). Financial Disclosure: The authors have no proprietary interest in any aspect of this study.